The all-new Nissan Patrol is a technological tour de force, even more capable, even more advanced, and even better equipped to challenge the largest and most luxurious SUVs. It introduces a new platform, a radical design direction, significantly enhanced interior comfort and luxury, a powerful new V8 petrol-fuelled engine with exceptional driveability, a new 7-speed automatic transmission, as well as a new ALL-MODE 4x4 system. 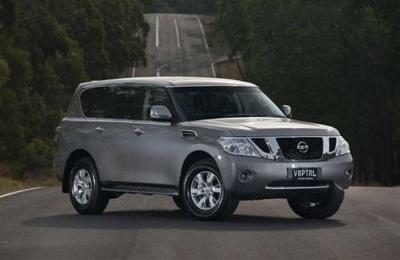 Set for launch in early February 2013, the all-new Nissan Patrol will be priced from $82,200* (plus on-road costs) for ST-L, $92,850* (plus on-road costs) for Ti and $113,900* (plus on-road costs) for Ti-L. The much-vaunted member of the Nissan family has been comprehensively reinvented for the second decade of the 21st century. While the look is all new and all luxury, the same iconic Nissan Patrol goes-anywhere strengths that have carried the nameplate for 60 years and six generations, have been refined and improved. The all-new 2013 Nissan Patrol boasts the power of an efficient and 'muscular' 5.6-litre V8 petrol engine, driving through an advanced 7-speed automatic transmission and a sophisticated, electronically controlled, ALL MODE 4X4 system. Suspension is now independent all round, a departure from the live axles of the previous generations; yet off-road traction has been enhanced. The all-new Nissan Patrol body is larger than before by some measure, offering sumptuously luxurious accommodation for up to eight passengers (ST-L and Ti models). Even with the third row of seats occupied there remains ample space to stow a full-size cooler box in the load bay, which is accessed by via a single piece lift-up tailgate. With the second and third rows of seats folded to form an almost flat floor, more than 3,100 litres of cargo space are released. The impressive V8 power train package is available with three trim levels: ST-L, Ti and Ti-L. A raft of class-leading performance features and advanced, intelligent technologies act to transform the Nissan Patrol from utilitarian to thoroughbred. Nissan is keeping the faith with customers for whom the Patrol is a faithful workhorse, however, with the previous Y61 generation turbo diesel model remaining on sale alongside the new Y62 generation. The Y61 will continue to meet the needs of drivers who desire an uncompromising and great value off-road experience, complete with diesel engine and traditional live axles. 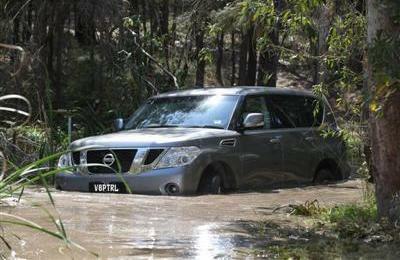 It has been 14 years since the last all new Nissan Patrol arrived in Australia. After 50 years in Australia, the Patrol is acknowledged as a tough competitor for the Nissan brand in the local 4x4 market. Nissan now takes its opportunity to extend beyond the large SUV segment into the luxury SUV market with the new V8-powered Patrol. This is the most luxurious and advanced Nissan ever offered in Australia. Major improvements have been made in fuel efficiency, comfort, luxury, overall quality and technology, for an improved drive on- and off-road. The new Nissan Patrol has been designed to cope with all types of terrain, and to be able to tow up to 3,500 kg with ease. The new generation V8 engine delivers 298 kW of power and 560 Nm of torque, with 90 per cent of torque available from just 1,600 rpm. Yet despite significantly increasing power and torque over the Y61 generation petrol model, the new V8 engine is substantially more efficient, using only 14.5-litres per 100 km (Y61 4.8-litre six-cylinder 17.2-l/100 km). The new automatic transmission offers a wider range of gear ratios giving smoother acceleration from rest, improved ride comfort, and better economy. The new ALL MODE 4X4 drive system is controlled via a circular electronic switch cluster located behind the gear selector, allowing the driver easy mode selection for: sand, rock, snow or on-road driving, activation of the rear differential lock, VDC on/off and Hill Descent Control. The ALL MODE 4X4 controller also allows the driver to select between 4H and 4L. 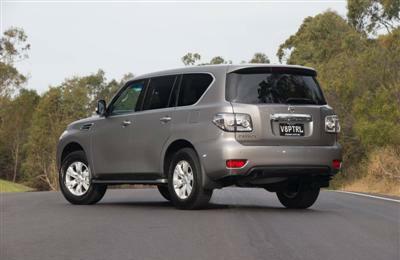 The new Nissan Patrol also features Hill Start Assist and a helical limited slip differential. A notable addition to the chassis is the arrival of Nissan’s Hydraulic Body Motion Control on suspension systems of Ti and Ti-L models. This reduces body roll in high-speed corners on sealed surfaces and maximises suspension travel in extreme off-road driving conditions. The HBMC system’s cylinders replace traditional shock absorbers and anti-roll bars. The technology was developed for world rallying and this is the first application of the technology for the road. The new Nissan Patrol also offers Intelligent Cruise Control, Forward Collision Warning, Blind Spot Warning and Lane Departure Warning and Prevention on Ti-L model. 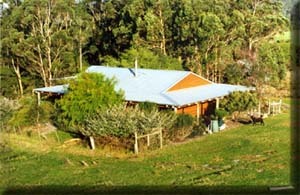 Immediately noticeable is the style and space on offer. The new Nissan Patrol is appreciably larger in every dimension than its predecessor, and its nearest rival. Interior accommodation has also been improved to a noticeable degree, especially for second and third row occupants who gain more leg and shoulder room. 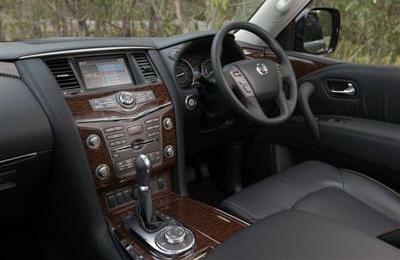 The new Nissan Patrol features a wide array of luxury accessories and features as standard on all models, including Bluetooth hands-free phone, large format front DVD player, 2GB music server with 6 speakers, iPod connectivity, steering wheel audio controls, intelligent key access, 8-way power assisted driver’s seat, a full complement of active and passive safety systems, drive computer, dual zone climate control, front, side and curtain airbags, active front head restraints, and front and rear parking sensors with rear view camera. The Ti model adds the new Hydraulic Body Motion Control system along with leather trim and 6-way electric adjustment for the front passenger seat, auto headlights, sunroof and rain sensing wipers. The top-of-the-range Ti-L adds memory function for the driver’s seat, steering wheel and door mirrors, a voluminous centre console cool box, hard drive navigation system, premium BOSE audio with 13 speakers, dual 7-inch DVD screens in the rear of the front seat head restraints, Around View Monitor, intelligent cruise control, xenon projector headlamps with auto levelling and washers, puddle lamps and a power operated tailgate. A tyre pressure monitoring system is also added along with Blind Spot Warning and a vehicle alarm. “We paid special attention to the needs of current Patrol owners, and their passengers, and so focused on creating first-class levels of comfort for the whole family,” said Hiroyuki Fushiki, project head and Segment Chief Product Specialist at Nissan Japan. “Heightened luxury, a roomier cabin and a quieter ride combine to achieve this goal, while maintaining Patrol's superior off-road heritage,” he says. “The all new Nissan Patrol has arrived in the luxury 4x4 market exceptionally well-equipped in every way,” says William F Peffer Jr, Managing Director/CEO of Nissan Australia. NOTE: * Manufacturer's List Price (MLP) excludes dealer delivery fees and the numerous statutory charges (commonly known as on-road costs). Additionally, please note that all prices, fees and charges are subject to change without notice, as are the specifications. E&OE.